There is nothing worse than coming home from a day out with family and finding water dripping from your ceiling. If you have a leak, it is quite possibly due to a burst water heater in your attic. Water leaking from a heater should be dealt with swiftly to avoid extensive additional damage created by water seeping into floor boards and behind walls. If you have a leaking water heater unit, call the experts at Complete Clean Water Extraction for a quick response. 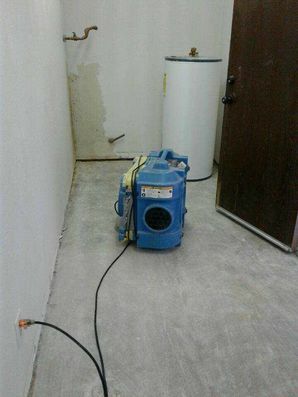 We have been resolving water damage issues caused by heaters leaking for over 16 years. Call (210) 239-0486 for quick dry out services. If your water heater is leaking, of course you will want to call your HVAC contractor to address the faulty system. The problem is further complicated if water has penetrated and damaged extensive areas within your home. With our moisture detection equipment, the water damage experts at Complete Clean Water Extraction will assess your home for areas that have been breached and will quickly devise a plan to dry out your walls and flooring, protecting your investment. The dry out pros at Complete Clean Water Extraction frequently get calls from customers saying, "Help, my water heater exploded!" When you've got water everywhere, it is time critical that dry out services are implemented immediately. Sitting moisture creates breeding grounds for mold and mildew, further complicating the damage. Complete Clean Water Extraction has been in the business of drying out water damaged homes resulting from water heater leaks since 2003. Our crews are standing by to immediately address your emergency and prevent further damage. In the event of a water heater leak emergency, one quick call to Complete Clean Water Extraction will allow us to quickly assess the extent of the water damage to your home. Once this assessment is complete, blowers and dehumidifiers will be installed to ensure all of the moisture in the water damaged areas is thoroughly removed, preventing costly mold and mildew damage.